‘Sofa or couch’, that’s the statement that we use most frequently. However, little do we know these two words are much more than synonyms! We can somehow bet sofa is not another word for the couch! From their definitions to functionality, they differ, although not from the huge margin. Nevertheless, highlighting the difference between the two is still important. Because who would want to live their entire life in a total lie? Exactly for this purpose, we’ve sketched out the article. 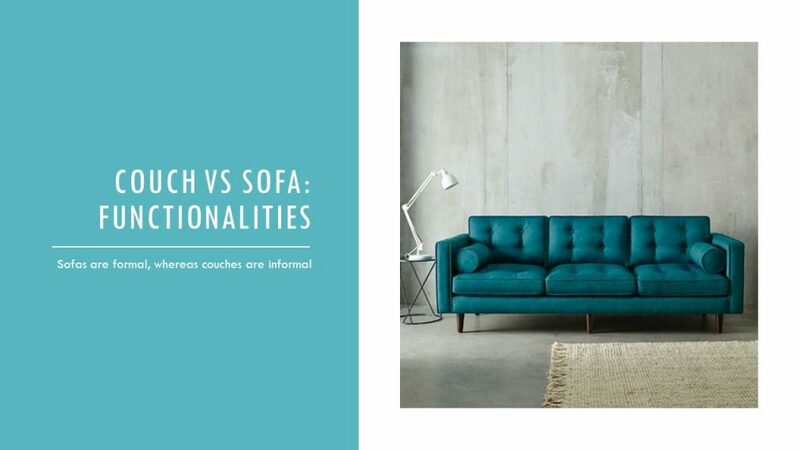 You will not have to search online for the query ‘what is the difference between a couch and a sofa’ after reading this article. We’re positive it won’t let you use both words carelessly again. So, fasten your seatbelts, we’re about to dive into the ocean of cozy furniture! Let’s switch the time to the ancient one to understand the terminology. Many centuries ago, the human race wasn’t too advanced to present the posh sofas, stitched and upholstered perfectly. Not to mention the sleek designs as well. The origin of both of the words, ‘sofa’ and ‘couch’ differ. Sofa originated from Turkish whereas Couch originated in Middle English from French. Search up the couch or sofa definition on the internet. You will get to know that both have a completely different background. The term sofa is derived from the Arabic word ‘Suffa’. It is used to describe a bench covered in blankets and cushions. On the other hand, couch comes from the French word “couche” which means to lie down. It has a background that revolves around the Victorian era. It refers to the piece of furniture that was popularly used in the Victorian era. As shocking as it sounds, it’s true that their structure isn’t the same! You must have watched your favorite characters talking about relaxing on a couch. Or maybe a gang leader asking his rivals to sit on his sofas. Perhaps your kiddy version would’ve felt joy in thinking they caught a synonym! What you must have missed would be the difference! No, you’re not at fault. It’s highly possible even the directors couldn’t differentiate between them. After decades, let us open doors to the ‘secrets about differences’. This time, or correctly this heading, for the structure! Sofa usually has two armrests and uniform back. While looking at it, you’ll get fancier vibes. Conventionally, sofas are designed to have a slick and posh look. This is why the functionality of the sofas and couch also differ. In couch, there is generally one armrest. Sometimes, you’ll also find couches without any armrests at all! The back, on the other hand, is often tapered. The sleek design is not always the top priority for couches. What’s important is that the structure should look welcoming and lively. Now, this is something on which I would put a lot of pressure! That’s because size is always and always an important factor to look for. Whether you are running to buy your favorite stilettos or branded sneakers, prioritize the size. There’s no need to highlight the issue revolving around bad-size shopping. At least I need to be driven out of the suburb to exchange my newly-bought pumps. It’s definitely unwise to compromise on too compact shoes favoring bruised feet. Bad furniture size can hurt our time and feelings almost in that way. 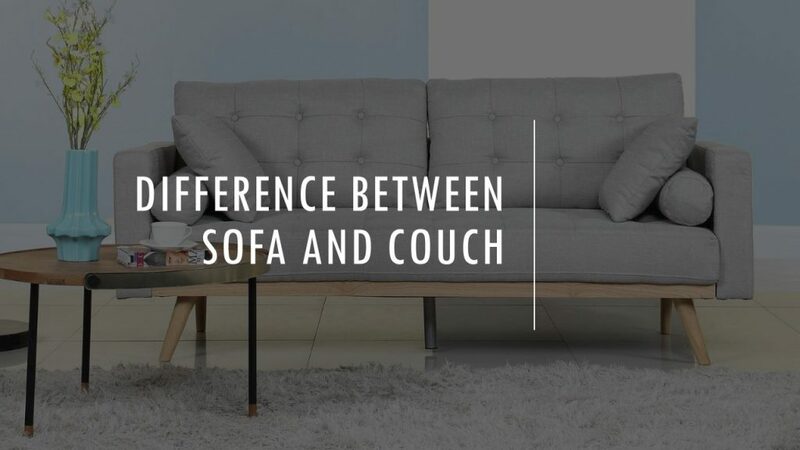 For sofas and couches, however, there is a difference of opinions. All that is based on the number of people who are most likely to sit on that. Some people believe that a sofa is usually for a lesser number of people. According to them, the sofas are for less than three people. While many others believe that sofa welcomes more than three people. The latter ones support that with the presence of ‘sofa’ in ‘sectional sofa’. Naturally, many people can sprawl over it comfortably. No cramping required! Additionally, you may come across Futon sofas or sleeper sofas. That means a sofa can integrate pull out beds as well. This hints on the sofa being more spacious than couches. The same difference of opinions in terms of size lies for couches too. Some people believe that a couch can let more than 3 people sit on it. However, some think the opposite. However, my personal opinion will coincide with the latter one. That’s because the couch is conventionally portrayed as small, personal space-favoring furniture. What’s the first parameter to consider while distinguishing a sofa and a couch? My advice would be to go for Functionality! We’ve already hinted on this trait in this article. However, it’s time to go into detail. In terms of functionality, there’s a remarkable difference. I feel this is the main area where you can easily differentiate a sofa from a couch. Sofas usually give a professional, and a formal stance. For the same reason, these are designed by prioritizing the posh look. Its place would be drawing rooms or formal office rooms. Couches can accept laid-back design. However, the words coziness and comfort majorly define couch. These are suitable for family rooms or bedrooms. That’s why most people search for comfortable couches when they are planning to buy furniture for living rooms. With couches, you can throw yourself into it for perfect novel reading. Or maybe a horror movie night amidst screams and chilling vibes. Couch gives unexplainable comfort after a tiring day or on a raining evening. It’s time to summarize our findings! We’ve made the precise table to answer the question in the most efficient way. To define sofa briefly, we’ll go by the belief it’s derived from the Arabic word which means a bench covered in blankets and cushions. Sofas are widely considered as the furniture with two armrests and uniform single back. The couch definition would be similar to that of the sofa if you just skim the looks. It’s the furniture popular in the Victorian era, and conventionally has one armrest or none. Sofas are largely accepted as more space-consuming furniture. It can accommodate more people than that on the couch. Couches are more compact but suitable enough for 2 or 3 people. Sofas are deemed as formal furniture and are usually placed in rooms for formal guests. Couches are specially designed for providing comfort. 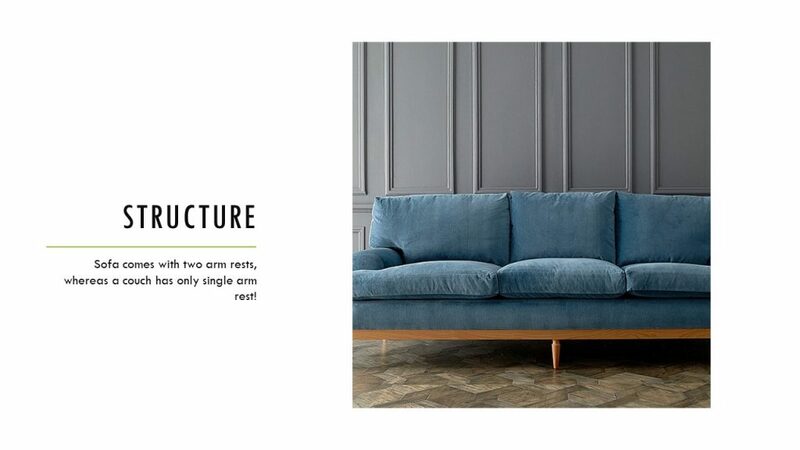 It wouldn’t be wrong to consider couch’s meaning as cozy and comfy furniture designed for casual use and sittings. We’re certain you might not be taking ‘couch’ as another word for sofa after reading our article.